A very feminine and popular necklace or choker design is using your favorite organza ribbon to string beads. But how on earth do your string ribbon through that tiny bead hole? Well, there are two techniques I can share. 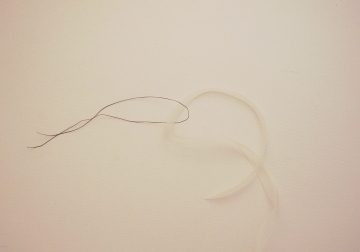 Using the first technique, you will cut the end of the ribbon into a sharp point and thread that through the bead. 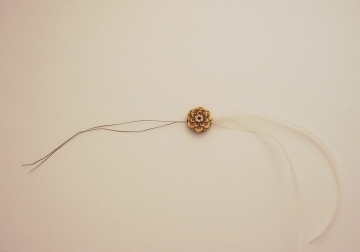 In the second technique you will use some thread or a collapsible big eye needle to wrap around the ribbon and pull it through the bead. Either method should work, just pick one and try it. Leave yourself several extra inches of ribbon because some part of the ends will be wasted. Using sharp scissors, cut the ribbon into a long diagonal point on the end, leaving a long sharp tip that you can then thread through your bead hole. Depending on your design, string and crimp or knot as many beads as you want into place on the organza ribbon, and repeat this technique on the other end. Once you are ready to finish the ends, feed your ribbon through a crimp bead, around your choice of clasp or ring, and back through the crimp bead. Crimp your bead flat to hold the ribbon securely. Cut off the wasted ends of the ribbon close to the crimp bead (be careful you don't accidentally cut through the good part of the attached ribbon). This is an easy technique but will required that you fold and pull two thicknesses of the ribbon through the bead, so you need to have a wider diameter bead hole. If you are using thread - Fold the end of your ribbon in half. Thread a piece of thread through the ribbon loop. Hold the two ends of the thread and thread those ends through the bead hole. Pull to force the ribbon through the bead. If you are using a collapsible big eye needle - thread your ribbon through the needle hole. Thread the needle through the bead hole and pull until the ribbon is threaded through the bead. Depending on your design, string and crimp or knot as many beads as you want into place, and repeat this technique on the other end. Coming Soon! Join our Newsletter for free jewelry design projects each month!